Now for the review. This game was all puzzle. Where ever you looked, there is a puzzle! Action also layered the game from top to bottom. There were a few repeated puzzles, but mind those. The first puzzle of the game is genius with the way that the lasers hurt you. I give a big thumbs up on that puzzle. Great job Mastam. This game had great gameplay from placement to lagness. No lag in this game made it easy to move around and explore the game more every time. 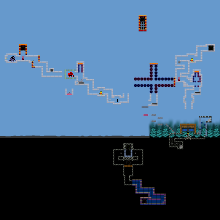 The gameplay was a fair mix of tile and enemies, a long with the way the game was in the air most of the time. Now to the real game play of this great game. Main start out, just a pretty different look. Not like you can judge the game from the opening seen though. 2 paths. One with a blast gun, and one with a flamethrower. The puzzle to the flamethrower is a nice beginning puzzle for the game. A quick water jumping puzzle is all. You mainly need the flamethrower in this case for the sand blocks or the better usage of the flamethrower, melt blocks. Once you get through, you are struck with a quick little blast of laser. It hurts you 3/4 of your damage and your game is already at risk. At this point, you might want to get away. After that are the great puzzles and action, but I didn't do that. I just went the easy way through the mistake which will not be told. Through there, you have to beat a george and a thug, and get past a fire troll to the crystal with a little easy-puzzlish-fun game. Mastam, on the forums you looked at the game carefully and took your time, I believe you. I just wished you could've saw the gap. It's fine, but cover it if you can. Everything else is great and I wouldn't change it a bit except for the gap. Great game with a lot of puzzles and action points.